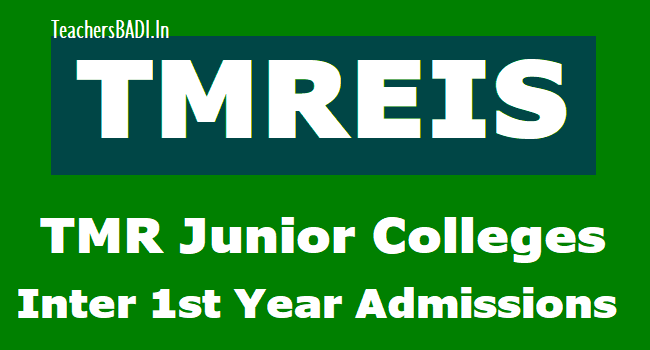 TMR Junior Colleges Inter 1st year Admissions 2019 (TMREIS TS Minority Welfare): TMR Junior Colleges Admissions into Intermediate 1st Year for the Academic Year 2019-19. Online Enrollment for Intermeidate first year admissions in TMR Junior Colleges 2019. Online Registration for TMR Junior Colleges will start from ..-05-2019. Telangana Minority Welfare Residential Schools Admissions into Intermediate 1st Year for the Academic Year 2019-2020. TMRJC Online Application Form for Admissions into Intermediate 1st Year for the Academic Year 2019-2020. Online Applications are invited through TMREIS Official website tmreis.telangana.gov.in from the eligible candidates from Minorities (Muslims, Christians, Parsis, Jains, Sikhs & Buddhists) and Non- Minorities (SCs, STs, BCs & OCs) Communities for Fresh Admissions into IntermediateFirst Year in TMR Colleges of Telangana State. 3. Annual Income of Family: For Rural candidates the Annual Income should be below 1.5 Lakhs,for urban candidates below 2.0 Lakhs.